by reading this till the last sentence, I assume Mr Camus is an expert of China. OMG!!!!! This is totally off topic John, but i noticed you’ve got this new pop up at the bottom of the blog pushing related articles. Just out of interest, has it had a noticeable effect on your readers, like has the number of page views actually gone up? Again totally of topic and I apologize so, but I’m interested to know. Honestly, I couldn’t tell you! I just don’t have the time to dig into that type of data these days. I’m lucky if I have time to get up two posts a week lately (and I failed this week). I haven’t read any Camus but your quotes make his writing sound rather hopeless and fatalistic. That’s a common criticism of existentialists, but it’s not altogether accurate. 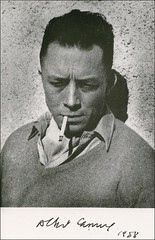 Camus was not however, an existentialist. He stated clearly that he was “surprised” when he and Sartre shared labels (existentialism). People frequently don’t like to be labeled, but it doesn’t mean there isn’t some truth to it. I’m not sure if his writings are applicable to China, but his photo with a cigarette in his mouth certainly would reflect that aspect of the culture. hmmm… could these statements be used to discribe a range of rapidly developing cultures eg India? This guy sounds like a very deep thinking philosopher… either that or he is very observant.